Recently my little family got to go watch my children’s brother go play lacrosse. It was a very interesting experience. My oldest son is quite social and usually gets a lot of smiles and response when starting conversations. But here, nothing. As we waited for their brothers second game their Aunt (brothers mom) and I chatted as big D flitted in and out of the adults and everyone stayed straight faced, staring at the current lacrosse game. And then something happened. Finding no response from the adults big D ventured down the hill to the puddle, little D following close behind when he saw where he was headed. They started out tentatively. Dipping their feet in, pushing sticks in but it wasn’t but a few minutes before they were chugging up and down the puddle, throwing pebbles and splashing all over the puddle. And an incredible thing happened. These straight faced parents broke a smile. Started to chuckle and some outright laughing as they watched two boys, now completely oblivious to the adults around them, play as only two children can play in a puddle. Not only did people smile and enjoy but they even felt moved to come ask me if those were my boys and essentially say how wonderful it was to see two boys just play. I could have let it go to my head and think what a wonderful parent I was but I think it was a much bigger message than that. It likely tugged on memories of their own childhood. A childhood far removed from most children’s today. When you strip away all the parental concerns of getting dirty, of germs, of having cold, complaining kids you don’t want to deal with you are left with a childhood much like ours growing up. People remember that childhood with a wistfulness of a by gone era. But as they see two boys playing in a puddle it doesn’t seem that far away and it seems within reach. I have a very strong belief in letting kids get lost in their play. 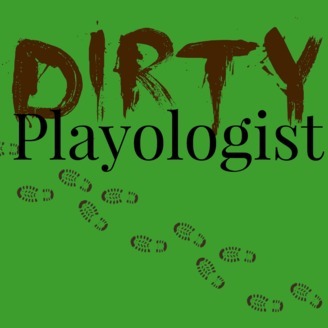 If it means they get messy or wet, if it means they lose their toys as they float down the river, if it means they play without adults to join in a wholly childish world (and adults largely discount how they change children’s play when trying to join children creating their own world). If this taught me one thing it taught me this. That the way to create this for not just my kids but other kids is to just do it. People have a sense that it is right and will support you and this builds a community where this is supported and encouraged from not just one families children but all children. 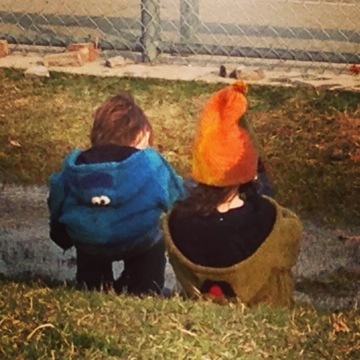 So to anyone who remembers my two kids playing in a puddle last weekend and you smiled, or laughed thank you. Or if you talked with your friend about it or even came up to me to put in your vote of support, thank you. Or even if you saw any child or children playing with abandon and did the same thing – thank you. Thank you for helping build a community where it makes it easier to let your kids play, to let them create their own world, to delight in the simple pleasure of jumping in a mud puddle. Thank you. We were going to the store on a snowy sleety day. The family spots, which I won’t be able to use soon, were full. Right behind the family and disabled parking, normally stock full, there were 3 wide open spots, right next the the store. Why? Because a large, shallow puddle encircled all 3 spots. Most families, and people, see the puddle, they slow down. If you look close enough you might be able to see the gears turning in their head. Is it worth it, they ask themselves. They show their non committal to the challenge because their car never actually stops, just slowly rolls by. You know that moment when they decide it’s not worth it because the slow motion car suddenly returns to driving speed and they start searching for the next available spot. Then along comes the outdoor family. Now, I must admit, the challenge is not so great as for other drivers as the entire family has left the house outfitted with rain boots, for no other reason than it is habit. Instead of considering a challenge the driver sees the puddle and smiles. As she opens the car door the smiles are replicated as the children look down and see the giant puddle that envelopes the car and the squeals and splashing begin as the children secretly hope it takes a long time to get the next of child out. And as the driver wrangles the kids towards the store, with the promise of the puddle still being there when they get back, the short 3 second trip inside means safer travel for the children and less time for them to escape in the parking lot before being locked in the cart. That is a win – win situation.